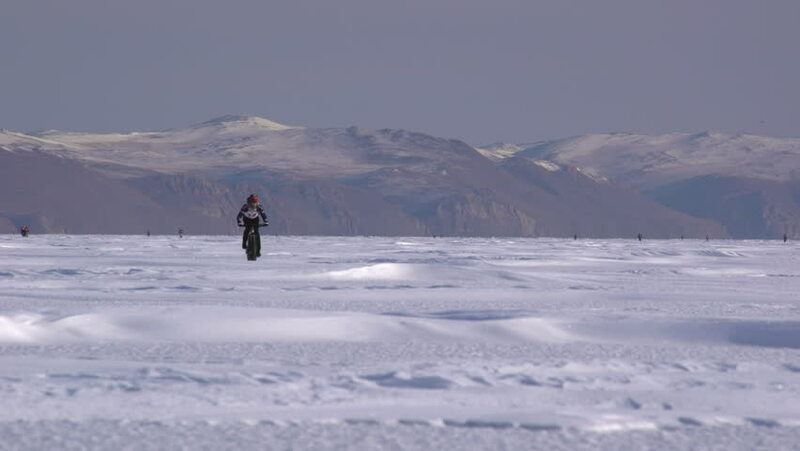 a man riding a bicycle across a frozen lake Baikal in Russia in winter. 4k00:16KAMCHATKA PENINSULA, RUSSIAN FAR EAST - FEB 9, 2019: Group of skiers running along winter ski track on sunny day on background of volcano. All-Russia mass ski race - Ski Track of Russian Federation. hd00:11Lake Tuz, Turkey - September 1, 2016: Color footage of people walking on Tuz salt lake in Turkey. Lake Tuz (Tuz GÃ¶lÃ¼) is one of the largest hypersaline lakes in the world. 4k00:41Two hiking men walking, drone shot. Aerial view of two male hikers walking snow mountain landscape. Winter sports concept - scenery of people trekking together on extreme winter expedition tour.